On November 1, 2012, just days after Storm Sandy, Episcopal Health Services hosted an accreditation site reiew for their CPE Program with the College of Pastoral Supervision and Psychotherapy (CPSP). The Rev. Dr. Steven Voytovich, a CPE Supervisor certified with CPSP and the Association for Clinical Pastoral Education, is the Director of CPE at EHS, with facilities in Far Rockaway and Brooklyn NY. Click here to see an article highlighting the accreditation review posted on the CPSP website in the midst of impacts from Storm Sandy that hit this area hard. Fr. Steven began supervisory training at EHS in 1995 when the program began, and returned there after the retirement of The Rev. Dr. Richard Liew in 2010. This CPE Program is quite distinctive as indigenous CPE training has been offereded there since 1999. Indigenous training involves partnering with persons in various settings around the world to build clinical training programs that take into account contextual elements unique to each setting. Dr. Liew began this work, and Fr. Steven was a faculty member of the indigenous program beginning in 1999. Now that he has returned to EHS (click here to view EHS website), Fr. Steven hopes to continue building upon this groundbreaking work in the coming years. An accreditation review is very similar to having The Joint Commission visit hospitals to ensure caregiving starndards are being met. Site reviewers look for the CPE Program to be at least fulfilling the standards of the accrediting body (in this case CPSP), commends particularly strong dimensions of the program, and offers consutation around opportunities for growth. Accreditation renewal is important step in the building process for all CPE Programs, not unlike periodic re-certification reviews offering similar opportunities for chaplains and CPE supervisors. CPSP requires an onsite review every seven years. Fr. Steven is excited about the work lying ahead now that the review has been completed. This review will be ratified at the upcoming CPSP Plenary in March. The Holy Eparchial Synod of the Greek Orthodox Archdiocese of America convened in its regular fall meeting on October 17 and 18, 2012, at the Synodal Chamber of the Holy Archdiocese in New York. Click here to see the full article on the Greek Orthodox website. This is wonderful news especially as laypersons and clergy will be recognized in institutional chaplaincy as is the case for the OCA. Thanks be to God! 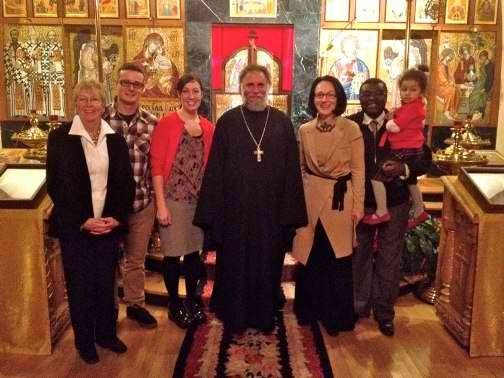 On Tuesday, January 17, 2012, two chaplains, Jessica D’Angio and Larisa Waya, were commissioned as Orthodox Chaplains in Boston. Please click here for the article posted on the OCA website. Photos were also taken during this service. Please either follow above link or click here for the photos. Fr. Robert Arida, pastor of Holy Trinity Orthodox Church, celebrated the Commissioning Service and you can listen to his homily here. Commissioning and endorsement are both required for those seeking certification as institutional chaplains, and is a way to bring together the parish community where chaplains attend liturgical services with the greater community where they serve. Institutional chaplains have typically completed at least an M.Div. Degree, and have completed at least 1600 hours of supervised Clinical Pastoral Education. We continue to celebrate the ministry of our institutional chaplains, and ask for your prayers not only for chaplains serving in institutional chaplaincy roles, but for our military chaplains who are supporting our men and women serving in all the branches of the armed forces.